It's no secret that energy costs - oil, natural gas, even coal - have gone up in recent years. With a burgeoning worldwide population and instability in some energy-producing regions, this isn't likely to change anytime soon. For this reason, it is more important than ever for homeowners and business owners' properties to be operating at peak efficiency. Wasted heating and cooling expenses contribute to millions of misspent dollars every year in the US alone. The diagnosis of the problem for a property can only be done with the skills and tools that come from a certified weatherization professional. As a result of the increasing costs of heating and cooling, the demand for home weatherization professionals has never been greater. If you're interested in becoming a member of this fast-growing industry, you've come to the right place. LearnWeatherization.com is a training portal for the Professional Home Inspection Institute, which has been training home inspectors and weatherization professionals for years and can help you on your way with your new career. Weatherization and Insulation Remediation work is typically performed after a comprehensive energy audit where problem areas have been identified. Work can be performed when a homeowner seeks to reduce heating or cooling costs, as a condition of a real estate transaction, or by a business owner looking to reduce overhead costs. This Weatherization and Insulation Remediation Course, provided by the Professional Home Inspection Institute, will give you the training you need to weatherize, insulate and improve the overall energy efficiency of homes. Over the past hundred years, many types of insulation have been used to regulate temperature in homes - this course covers information you will need to know about these and will not only teach you how to identify insulation defects, but will also show you ways to remediate insulation problems. Weatherization and Insulation Remediation can be a perfect fit for any building professional or home inspector who wants to expand their services or offer energy auditing inspections. After you progress through the interactive course and learn the concepts in each lesson and complete the quizzes, your instruction will culminate in a final exam to verify that you have mastered the course content. 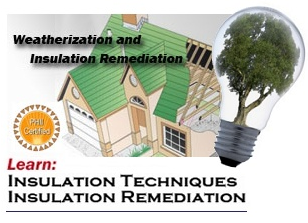 Please click here to view our available courses relating to weatherization and insulation remediation. Professional Home Inspection Institute is committed to expanding training access to weatherization and energy efficiency experts. By providing quality, comprehensive training courses across the United States and Canada, our interactive training courses provide new professionals with the skills needed to satisfy the ever-growing demand for services. The interactive training packages are comprised of four weatherization courses, teaching the basics of insulation and energy efficiency. The Energy Audit Diagnostics Course will teach you the auditing process with specific information on how to conduct the tests. With lessons on thermal imaging, blower doors, furnace testing, combustion appliance tests and duct leakage, you will have the foundational skills needed to begin testing residential homes. For more information about the courses we offer or for answers to any questions not covered here, please give our friendly staff a call toll free at 800 983 6322, six days a week, 12 hours a day.